Align with our aim to empower human capital and create young global corporate leaders, MACFIS is giving a few of the UK’s brightest and most motivated students the chance to engage and network with some of Malaysia’s top graduate recruiters all in one evening. Dato’ Seri Johan Raslan is the Executive Chairman of Pricewaterhouse Coopers Malaysia. He has over 25 years of experience in audit and business advisory both in Malaysia and the United Kingdom. Dato’ Seri Johan holds a Bachelor of Science (Hons) degree in Economics and Accountancy from University of Hull, United Kingdom. Dato’ Seri Johan was admitted as a member of the MICPA in 2002 and became a Council Member of the Institute in 2003. 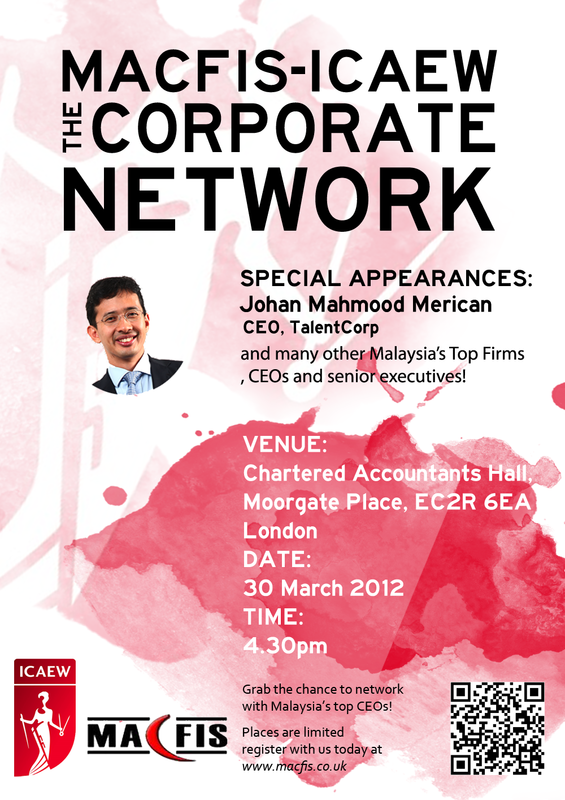 Johan Mahmood Merican was appointed the Chief Executive Officer of Talent Corporation Malaysia Berhad (TalentCorp) on 1 January 2011. He has 16 years working experience in the Government and private sectors. Johan most recently served as Principal Private Secretary to the Minister in the Prime Minister’s Department. His roles in the Government involved policy work at the Economic Planning Unit and Ministry of Finance. He was instrumental in the development of human capital related initiatives such as the GLC Blue Book on Performance-linked Compensation policy, PINTAR (GLC school adoption programme) and Trust Schools (public private partnership model for schools). Prior to serving the Government, Johan worked in corporate finance and accounting roles at various companies such as MRCB, UDA Holdings Berhad, Sime Darby and PricewaterhouseCoopers. Johan holds a first class honours degree in Economics from the University of Cambridge and is a Chartered Accountant (Associate of the Institute of Chartered Accountants in England & Wales (ICAEW). Places are limited, apply NOW!